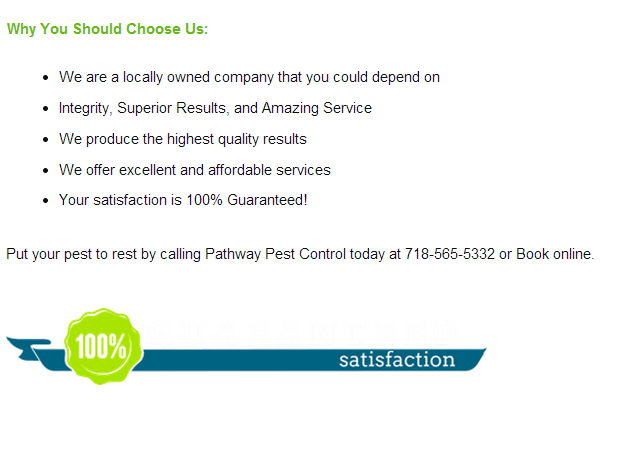 Primary reproductive’s (swarmer termites) are the caste most often seen by homeowners. They have fully developed wings and eyes. The winged adults are usually much darker than the other members of the colony. All four wings are the same length and extend more than the body beyond the tip of the abdomen. Although functional workers develop in a few months, it usually requires 12 months of progressive colony growth for swarmer termites to occur. Both male and female reproductive leave the colony in great numbers (swarms), usually in the spring or fall some species swarm in both spring and fall. These swarms are often the first visible indication that termites are present. 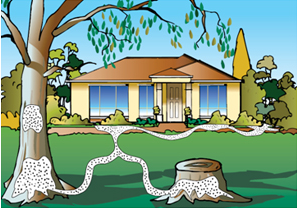 Environmental conditions must be just right before termites will swarm. The temperature, moisture (both within and outside the colony), light conditions, and even barometric pressure influence swarming activities. As a general rule, swarmers emerge on warm, sunny days, when the humidity is high (e,g, often on days following rain showers). After a brief flight, the wings are broken off, and males and females pair and attempt to establish a new colony. 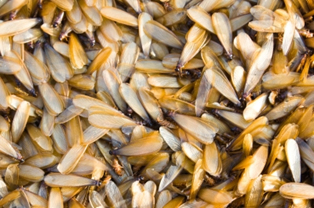 Swarmer termites are often confused with flying or swarmer ants. Since ants are often seen swarming in and around buildings, it is important to distinguish between the two so that appropriate control recommendations ca be made. 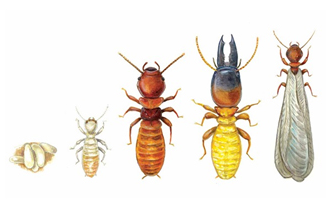 these are three ways to separate termites from ants. First, ants have a very thin waist between the thorax and the abdomen, while termites are broad waisted. 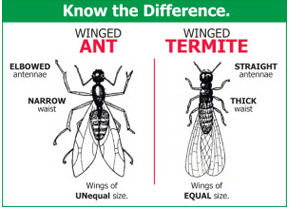 Second, termite wings are all the same size and shape, where as the forewings of the ant are larger, longer, and of a different shape than the hindwings. and the third, termite antennae are straight; ant antennae are elbowed.